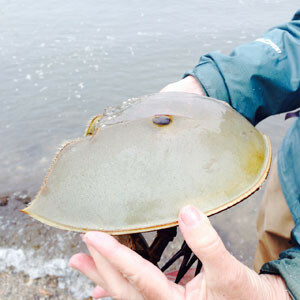 Since 2006, the Branford Land Trust has assisted Sacred Heart University with Project Limulus, a horseshoe crab study. The Land Trust helps coordinate the volunteers that conduct surveys on Branford beaches. Project Limulus, started in 1998, has conducted multiple studies focusing on the life history of the American horseshoe crab population living in Long Island Sound. During the 2013 spawning season, approximately 800 horseshoe crabs were tagged by approximately 35 Branford Land Trust volunteers. In addition, horseshoe crab eggs were raised in two classrooms in Branford public schools.